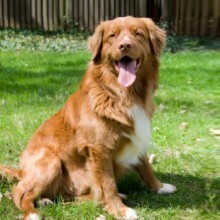 The Nova Scotia Duck Tolling Retriever, originating from Canada, worked alongside the hunters of water fowl. He has webbed feet which help him to swim well. He will eagerly jump into water to retrieve. He is typically an intelligent dog, easy to train and needs to be given challenges, both physical and mental. Agility type activities would suit him well. Ideally he needs a house with a garden, preferably within easy proximity to the open countryside (and some water). He is medium sized with a fine, glossy coat which will need regular attention. Haplotype test for maximum diversity ?